I bought my children new shoes for the first day of school and when they returned after winter break. Twice a year. Every year. In the budget or beyond the budget, they had new gleaming white tennis shoes as they marched into class for a new and improved quarter, semester, year. There were years Michael shook his head or suggested that the shoes they had were “perfectly fine.” He once argued, quite eloquently, that worn shoes were the best. That they held memories and there was such a thing as “worn to perfection.” I dismissed his opinions because new was a fresh start. A fresh start for whom? Surely my children didn’t need a fresh start. They were building themselves back then. Block by block, quiz by quiz, detention by detention. They needed all the experiences, all the worn-to-perfection they could get back then. 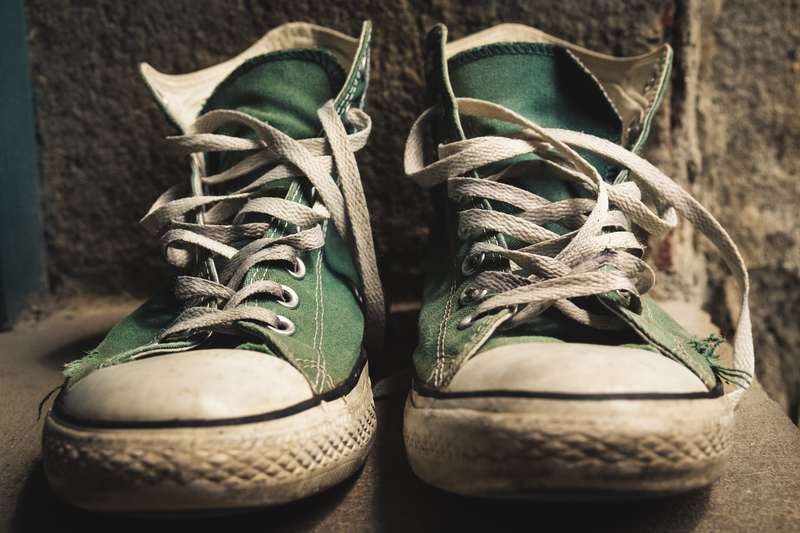 It’s hard to remember the me-back-then, but I’m reasonably sure the new shoe rule had nothing to do with my kids’ fresh start and everything to do with mine. Children are messy, everyone knows that, but the less acknowledged truth is that parents are too. For all the times we remember and come through there are the times we screw up, dismiss, and forget. God, if I had a dollar for every time, my child called me from school because I forgot to sign something I would have buckets of money. Mistakes are made in the process of growing up people. I don’t care what is on Instagram or who tells you it can all be managed and color-coded down to the last perfectly cut strawberry. They are full of organic crap. Some days are great, one or two might be perfect, but most are cluttered backseats, tears, smears, and mismatched socks. I spent many a new school year with the perfect plan only to declare myself a failure around the time the first scuffs hit those pristine shoes. Hindsight is crystal clear, so I’ll cut myself some slack, but if I were asked today—”What is the one thing you would tell your younger self?—my answer would be this: Stop with the shoes! If your children are lucky enough to have a favorite pair of shoes leave them the hell alone. If somehow in the yuck of growing up, your little people find a perfect fit, that awesome fade, the shoes that make them feel, if only for a second, their genuine selves, let them be. The muck of living doesn’t go away with new laces. The best we can hope for is that the soles hold up. I sometimes wonder if my need to remake myself every year as a new-and-perfect-this-time parent rubbed off on my children. Did they feel the weight of shiny and better everytime I laced them up and sent them on their way? I hope not. I could tell them now not to worry. I could explain what I have learned, but when I see them these days, their shoes are often worn and weary. Not a new tennis shoe in sight. I suppose there are things they figure out on their own. My thoughts from the laundry room. Slept In. Yep. So many worries and things I was so sure we had to nail–and now, in the bigger picture–not so much:). The nailing was in the day to day, consistently over time rather than perfect in any one day. Thanks for your beautiful words. I often look back at herding three school-aged kids around mostly by myself and wonder how in the world did I manage? Here’s to the stamina long forgotten. Well said. Raising children is messy, but we do the best that we can.